Frederick John Sweet was born on 11 February 1894 in Bowden, South Australia , son of John Joseph Sweet and Agnes Emma Norman. Serena May Sweet was born on 28 September 1896 in Brompton Park, South Australia , daughter of John Joseph Sweet and Agnes Emma Norman. Serena was buried in the Hindmarsh Cemetery, Hindmarsh, South Australia . 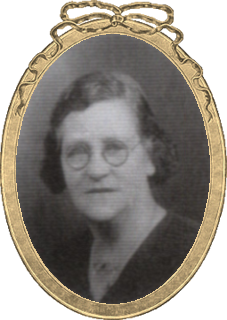 Ada Ellen Sweet was born on 6 June 1899 in Brompton Park, South Australia , daughter of John Joseph Sweet and Agnes Emma Norman. Norman Harold Sweet was born on 24 February 1901 in Brompton Park, South Australia , son of John Joseph Sweet and Agnes Emma Norman. Rhoda Evelyn Sweet was born on 20 August 1905 in Exeter, South Australia , daughter of John Joseph Sweet and Agnes Emma Norman. Catherine Mary Wilkins was born on 31 March 1864 in Lyndoch Valley, South Australia , daughter of Jubal Wilkins and Mary Beary. On 29 January 1881, Catherine, aged 16, married William Charles Oxlade, aged 19, son of Hector Oxlade and Ellen Finch, in Hindmarsh Registry Office in Hindmarsh, South Australia . She died on Tuesday, 6 August 1940, aged 76 years, 4 months and 6 days, in Ethelton, South Australia . Catherine was buried on 10 August 1940 in the Cheltenham Cemetery, Cheltenham, South Australia , Section D, Drive: B, Path (#): 7(18), Site Number: 30. 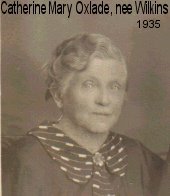 Mary Ellen Oxlade was born on 9 February 1882 in Hindmarsh, South Australia , daughter of William Charles Oxlade and Catherine Mary Wilkins. On 2 October 1903, Mary, aged 21, married William Manning, son of William Manning, in Telegraph Station in Port Adelaide, South Australia . Rosetta was also known as Rose Ethel Oxlade. She was born on 14 April 1884 in Kooringa, South Australia , daughter of William Charles Oxlade and Catherine Mary Wilkins. On 1 March 1902 Rosetta was admitted to the Destitute Asylum, Adelaide, South Australia. At the time of admission she was listed as a "general servant". Last Address: Roman Catholic Refuge, 1 week. Circumstances: Enciente, Putative Father George Tainsh, late master of the ketch "Victory" but at present working for his brother James Tainsh, a farmer of Port Lincoln. Left the institution 30/08/1902 with child. To c/o Mrs K. Oxlade, Sutherland Street, Glanville. [S1] Birth Registrations, SA Births 1842-1906, Book 246;Page 479. [S3] Marriage Registrations, South Australian Marriages 1842-1916, book 237: Page 692. Blanche Lydia Oxlade was born on 4 August 1891 in Thebarton, South Australia , daughter of William Charles Oxlade and Catherine Mary Wilkins. Frederick Laurance Oxlade was born on 29 January 1894 in Leslies Creek, South Australia , son of William Charles Oxlade and Catherine Mary Wilkins. On 10 August 1921, Frederick, aged 27, married Ellen Josephine Augusta Flaherty, aged 19, daughter of Peter Flaherty and Ellen Neagle, in St Saviour's Church in Brompton, South Australia .